› Author Affiliations Funding This project was supported by NIH R24 (5R24HD065688-05), awarded to the Boston Rehabilitation Outcomes Center, and the Eunice Kennedy Shriver National Institute of Child Health & Human Development of the National Institutes of Health under Award Number U54 HD087011 to the Intellectual and Developmental Disabilities Research Center at Washington University. Objective To identify the progression of non-nutritive sucking (NNS) across postmenstrual age (PMA) and to investigate the relationship of NNS with medical and social factors and oral feeding. Study Design Fifty preterm infants born at ≤32 weeks gestation had NNS assessed weekly starting at 32 weeks PMA with the NTrainer System. Oral feeding was assessed at 38 weeks PMA. Results There were increases in NNS bursts per minute (p = 0.005), NNS per minute (p < 0.0001), NNS per burst (p < 0.001), and peak pressure (p = 0.0003) with advancing PMA. Level of immaturity and medical complications were related to NNS measures (p < 0.05). NNS measures were not related to Neonatal Oral Motor Assessment Scale scores. Smaller weekly change in NNS peak pressure (p = 0.03; β = –1.4) was related to feeding success at 38 weeks PMA. Conclusion Infants demonstrated NNS early in gestation. Variability in NNS scores could reflect medical complications and immaturity. 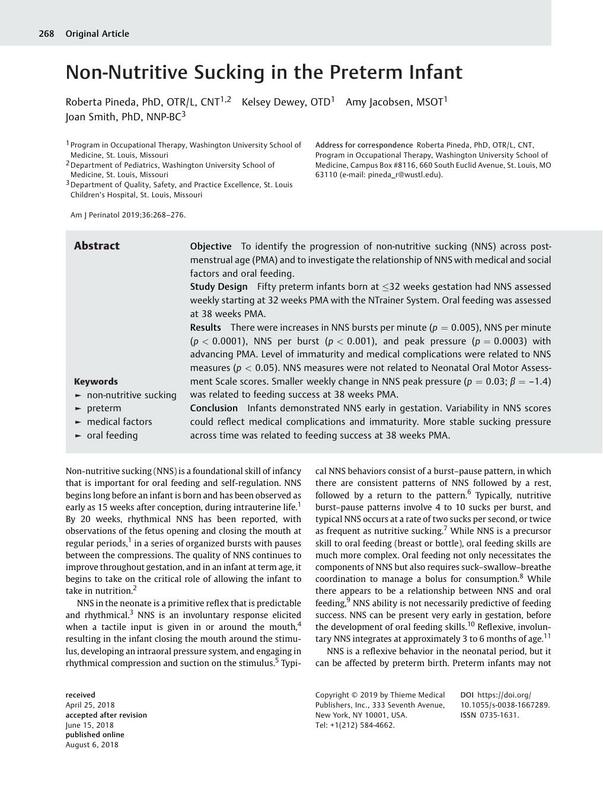 More stable sucking pressure across time was related to feeding success at 38 weeks PMA.